Posted on October 1, 2018 by Sophia D.
Mostly everyone has heard of the musical that has swept theatre geeks off their feet when it first came out in 2015. Yes, I’m talking about Hamilton. If you don’t love it, you’ve heard of it. If you haven’t heard of it… you’ve come to the right blog. Hamilton: An American Musical was written by Lin-Manuel Miranda who has had experience in writing a musical with In The Heights. He co-wrote the songs from Disney’s Moana. But, Lin-Manuel Miranda is most popular for writing Hamilton. 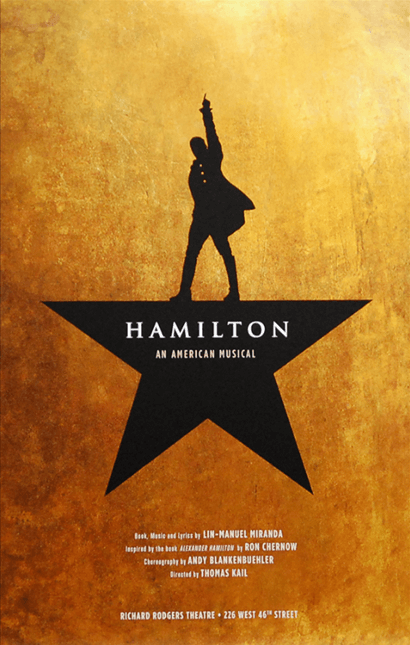 Hamilton is a perfect combination of spunky, fast-moving rap, and slow, sweet, and sad melodies. I’ve listened to the music over and over, until it’s been ingrained into my memory, like the true geek I am. Unfortunately, this means I have physically lost the power to cry over ‘It’s Quiet Uptown’. Now, listening to the soundtrack on YouTube and watching the musical are two very different things. I had the privilege to go see it at Segerstrom Theater. I think when we entered the waiting room to buy tickets online, it was the most stressful 43 minutes of my theatre life. And that’s saying a lot, because I’ve had to wait a week to get my part in multiple musicals. When I was watching Hamilton, it was different from listening, partially because it wasn’t the original cast (I wish it was! ), and of course they sounded different. But, watching the actors pour their souls into the life of a man who lived centuries ago. If you were to ask me who my favorite character was, or who stole the show, I wouldn’t say Angelica, Eliza, or even Peggy (although she was amazing). King George was a showstopper. Though he stood in one place for the remainder of his songs, something about him, singing about death, completely calm, just made everyone laugh. In the beginning, he stood calmly, but in the second half of the show, King George, just like in real life, started to go mad. His eyes were wild, and his laugh maniacal. He completely stole the show, in my opinion. Hamilton: An American Musical, is something me and my theater friends bond over. Before rehearsals, we could be heard singing Farmers Refuted, or Cabinet Battle #1. Hamilton is the perfect mix for anyone, whether you like rap, or slow, sweet songs, it has it all. This is a story about Tom Joad and his family immigrating to California. Their homeland in Oklahoma is being cultivated by tractors from the bank and the police officers beat them to hell more often than breathing. In this miserable and harsh trip, their grandparents died, and Tom’s sister’s husband ran away. His brother wasn’t able to move with them so he stopped at a desert in the middle of the trip. The government camp provided hot water and the protection away from the deputies. But other times, people are treated akin to pigs, but without the slosh their owner pour in the mange every day. The people craved for slosh but found none. To me it’s really inscrutable why people separate from their family, it’s like the fear will devour you into the black hole in the galaxy and the entire world fades away from your fingertips. And the bank in this novel sounds brutal to me, just because they want to expand some business land, the people and tenants living there are forced to leave their beating hearts on the land and left with their inane corpse. Ma is the person that resonated with my emotions and logic because she was like the leaves of the family tree. Sometimes, when autumn comes she turns yellow and shrivels a little, but her greenness brushes the entire forest with freshness and was the food and shelter to a lot of people when spring emerges. Without the oxygen, we won’t survive. The animals and the oxygen is the buttress of the inveterate root to keep stretching. And that’s Ma. John Steinbeck’s The Grapes of Wrath is available for checkout from the Mission Viejo Library.